← BEFORE TIME EXISTED, I KNEW YOU. “ Now there was a man in Jerusalem called Simeon, who was righteous and devout. He was waiting for the consolation of Israel, and the Holy Spirit was upon him. It had been revealed to him by the Holy Spirit that he would not die before he had seen the Lord’s Christ. Moved by the Spirit, he went into the temple courts. When the parents brought in the child Jesus to do for him what the custom of the Law required, Simeon took him in his arms and praised God, saying: “Sovereign Lord, as you have promised, you now dismiss your servant in peace. 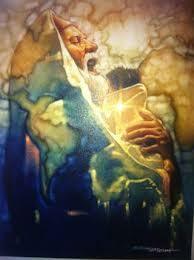 Simeon held the Lord of the Universe in His arms. He could now rest in peace because it would be the Lord who would now hold Simeon in the palm of His Mighty Hands. God had fulfilled the Messianic promise of the ages to His children that the Messiah of Israel, the Christ of His Church, the SON of GOD would come to earth in human form, to walk among them…and He did. The word Abba is a beautiful Hebrew word. It is the word we know as Daddy. This is the word God has chosen for describing Himself personally to you and I in HIS Scriptures. WE are His children and He is our Daddy…if you know HIM as LORD. We walk through this life holding onto our Daddy’s hand. Then when He takes us through the front door into His house, our house; He will lift us up into His arms and give us a personal tour of the very room He has taken our entire lives to prepare for us to live in. YOU MEN WITH CHILDREN who are reading this need to know your children are a blessing from the Lord. It is your responsibility to raise up your children to know their Creator and to know the Scriptures that tell the story about the Son of God. Like John the Baptist, who came to prepare the way for the Lord. You also have been given the honor and the responsibility to prepare the way to your child’s heart so they will be able to accept Jesus as their Lord and Savior. GOD CALLS YOU to begin praying for their Salvation from the moment they have life in the womb. Then in LOVE, live your life before them and your wife and your God so there is no question in their minds about whom you belong to and whom you have chosen to serve. Then maybe God in HIS Mercy to you will bless you by giving you the desire of your heart, the desire of my heart… that each one of our children and grandchildren will become a Child of the KING.